What is your favorite animal? Many people, especially young children, have their favorite kind of animal. Hence, they tend to have such an animal as the house pet to play with. Surely, animals can always bring people all kinds of fun and have become the best friends of humans. Considering this, many commercial indoor playgrounds have filled their parks with various kinds of animal rides. Not only the children but also the adult can find the animal rides in the shape of their favorite animals. Usually, those animal rides have simple and neat designs which can help children to ride easily. Also, those rides for adults are strong enough to sustain different weights, which is considered to be extremely safe for riders. In those commercial playgrounds or indoor play centers, you can always come across to such kinds of animal rides. For example, those supermarkets, amusement parks, indoor or out playgrounds, shopping malls, and theme parks, are all good at using all kinds of animal riders to draw customers’ attention. Next, I will give you a brief introduction of animal rides and present you two main types of animal rides. Normally, animal rides can have different kinds of appellations like electric rides, walking animals, plush car rides, or even pony cycles. In the indoor playgrounds, you can always see the coin-operated animal rides and sometimes the non-coin operated ones. The animal rides usually come with two main types, which refers to the rides with plush covers and the ones with hard skin. In the following, we will choose one kind ride from each type of animal rides to give you a brief introduction about this commercial playground equipment. Generally, dogs are the most common house pets we can see in our daily lives. Such an extensive acceptation of dogs may owe to its great loyalty. Also, dogs, especially those meek types, are always friendly to human beings. 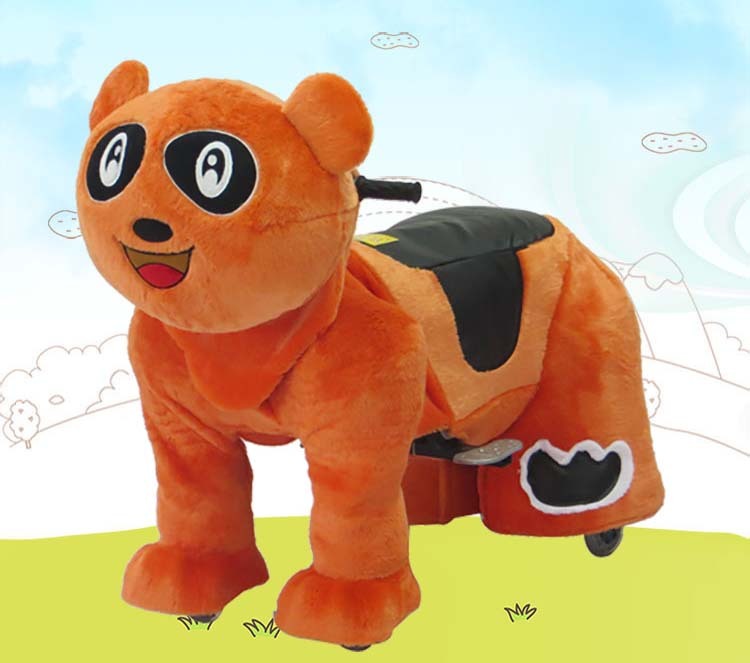 Paw dog is a typical type of animal rides with plush covers. It is one kind of animal rides having various shapes of a cartoon dog. The main structure of Paw dog includes a metal frame, plush covers, inside control box, and chain motor. Plush covers: Paw dog usually has plush covers, which can provide a comfortable riding experience. The outer of the plush cover is made of soft fabrics while the inner space is usually filled with cotton or sponge. The paw dog has an outer in the shape of a cartoon dog, which looks pretty adorable and meek. The various shapes will successfully attract many children’s attention. Metal frame: This animal ride can sustain at least 150 kgs. What a big bearing capacity it has! In fact, it has a strong metal frame inside to sustain your whole weight. Usually, the manufacturers employ high-quality and superb materials to produce the metal frame, which enables the frame to sustain a huge weight. Also, backing up by such a solid frame structure, you can ride the Paw dog in a peaceful mind without any fear of collapsing. Inside control box: The inside control box function as the core part of this animal rides. We can manipulate the Paw dog easily with the inside control box. Chain Motor: The chain motor is used to provide the power source for its moving. The drive system powers the ride by chains. Music: While sitting on its back and starting to move ahead, the Paw dog ride will play dozens of English songs with a memory card. You can sit on its back and take an adventure by riding around, meanwhile you can enjoy some pop music. Multi-direction: Powered by the chain motor system and supported by one 6” and three 4” wheels, this kind of animal ride can head forward and backward. Also, it can easily turn to left or tight to bring you more riding experiences. Fences: Sometimes, children may run into the way, on which the machine is going to pass. As a result of this, the children may get hurt or even be sent to the emergency rooms. Considering these safety issues, you will need a plastic or inflatable fence to make an active area for the animal rides. In this way, you can ensure children will be safe in your indoor playground. As for the lions, people conferred them an appellation: “the king of the prairie”. Also, lions always come as representatives of supreme power in their field. Normally, people can rarely see lions in their daily lives, so the indoor equipment suppliers made the lion rides to provide a special riding experience for those people. Lion rides are one kind of animal rides made of hard skins. This kind of animal ride has a different construction and features compared to the Paw dog. Let’s see what a lion ride looks like then. Framework: It has the high-grade steel to function as its main structure, which enables the machine to sustain a load up to 100 kgs. Its bearing capacity seems weaker than the Paw dog, but it still has superb stability. 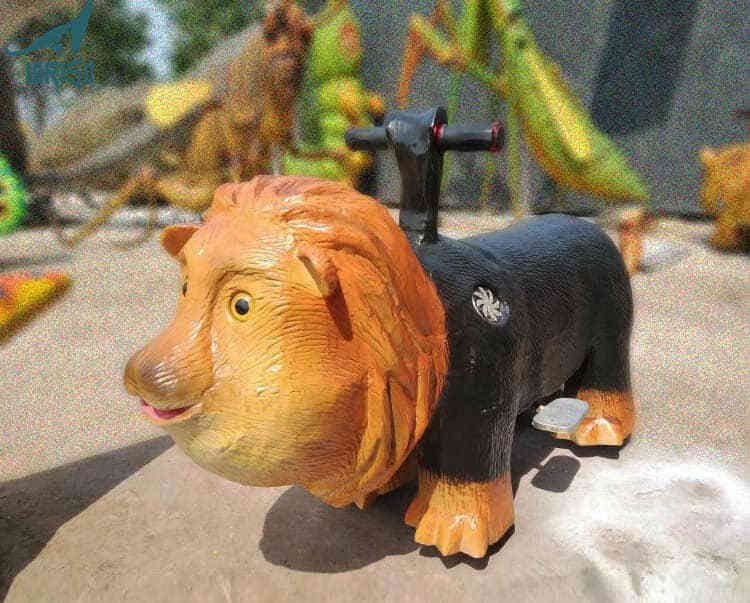 Hard skin: This kind of lion ride has hard skin, which is made of silicone. Actually, such kind of hard skin may not feel as soft as the plush covers. However, the hard skin also has its superiorities compared to soft ones. One of these is that the animal ride who has hard skin will be more durable than the one made of soft skin. CE motor: The lion ride gain its main power from the CE motor. With this kind of driving system, this ride can move at the highest speed of 125 m/min. Riders will have a smooth riding experience with this motor system. Color: Colors of lion ride are not only optional but also can be customized based on your needs. But the color always turns to be yellow due to the real color of a lion’s fur. Music: It can automatically play 20-25 pieces of the song, of which the types can be customized according to your countries’ mother language. The custom for music will make it much easier for local children to accept it and fall in love with it. Movement: Just like the way other animal rides move in. The lion ride can also move forward and backward, as well as make a turn according to your command. Technics: This product has 4 sets of movement programs, which means the lion rides can move in 4 different ways. Also, backed by this technic, riders can get 4 different types of riding experiences. That will help children stay interested all the time. Besides, this lion ride has 2 kinds of sound effect, from which you can choose to play during the riding. Above is the general information about two main types of animal rides. Learning from the introduction given from the construction and the features, you can get to know what an animal ride looks like and how to play it. Usually, children ages 3 and above can maneuver the animal rides without others’ help. In the case of children under 3, they will need the parent or caretaker to offer supervision. Because young children normally have limited abilities which means they have much weaker stabilities and abilities of balance than older ones. If you are running a commercial indoor playground business and looking for some new things to add more fun to your indoor playground, you can consider buying some animal rides to fulfill this. Whether for a normal play area or for some special events and parties, you can bring kids a lot of fun with such a fun animal ride. Once you have decided to buy some, the next step you may have to do is to find a reliable indoor playground equipment supplier to perform a further negotiation. As one of the best commercial indoor playground manufacturers in the world, Wonka Playground will be a reliable business partner to cooperate with. They have their own manufacturing factory, which is equipped with advanced techniques, to produce all kinds of animal rides. Also, they have employed a high standard in their production process, which can guarantee high-quality for products. If you need, contact them right now!